Downtown is bound by North Avenue to the north, Boulevard to the east, Interstate 20 to the south, and Northside Drive to the west. This definition of Downtown includes central areas like Five Points, the Hotel District and Fairlie-Poplar and outlying inner city neighborhoods such as SoNo and Castleberry Hill. The Atlanta Downtown Improvement District (ADID) organization, though, defines a much smaller downtown area measuring just one and two tenths square miles. This area is roughly bound by North Avenue to the north, Piedmont Avenue and the Downtown Connector to the east, Martin Luther King Junior Drive, Courtland Street, and Edgewood Avenue to the south, and the railroad tracks to the west. This area only includes the core central business district neighborhoods of Fairlie-Poplar, Five Points, the Hotel District, Centennial Hill, and South Downtown. The history of downtown began in 1826 with Wilson Lumpkin and Hamilton Fulton surveying a possible railroad route between Chattanooga, Tennessee, and Milledgeville, Georgia's capital at the time. In 1833, Lumpkin, who had become governor, requested that the state legislature charter three railroad lines. By 1836, the state-financed Western and Atlantic Railroad, linking the middle of Georgia to the other states north and west, was founded by the legislature and signed into law by Lumpkin. As a result, the town named Terminus was founded in 1837, named for the end of the railroad line. Terminus received a name change in 1842 when the town's 30 inhabitants voted to change the town's name to Marthasville, in honor of Governor Lumpkin's daughter. By 1845, John Edgar Thomson, chief engineer of the Georgia Railroad, suggested that Marthasville's name be changed. The first suggestion was "Atlantica-Pacifica," which was shortened to "Atlanta." In 1847, Atlanta was incorporated, with the town limits extending in a one-mile (1.6 km) radius from the mile marker at the railroad depot. By the outbreak of the Civil War, Atlanta was a major railroad hub and manufacturing center, making it a target for the Union Army. In 1864, General William T. Sherman burned Atlanta to the ground during his "March to the Sea," making Atlanta the only major American city to ever be destroyed by war. Atlanta's first resurgence began during Reconstruction. In 1868, Georgia's state capital was moved to the city from Milledgeville. By the 1920s, a downtown business sector ringed by residential districts had emerged. Professional sports came to Atlanta in 1965 with the construction of Atlanta–Fulton County Stadium and the relocation of the Braves from Milwaukee. The National Football League awarded the city the Falcons expansion team in 1966. The Hawks arrived in 1968, even though Omni Coliseum, the city's basketball arena, did not open until 1972. Two of the teams continue to play their home games downtown at Mercedes-Benz Stadium and Philips Arena. Business growth in the 1970s resulted in significant development in Downtown, most notably in Peachtree Center and the Hotel District. 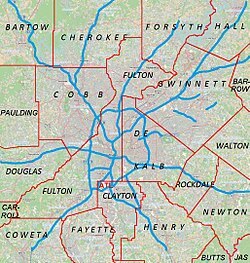 Economic development in these areas shifted the commercial center of the city to an area along Peachtree Street that was north of Five Points, however, despite the construction of the MARTA central station there in 1975. By the mid-1980s, Peachtree Center had become the core of a dedicated hotel-convention district that lay at the heart of the Downtown economy, even as the remainder of Downtown Atlanta deteriorated markedly. The closure of Underground Atlanta in 1979 due to an increase in crime contributed to perceptions that Downtown was dangerous, and the 1980s saw a significant decline in population. By 1990, Five Points was a "vacant shell of its former self," while Downtown as a whole was largely an "archepelagic assemblage of fortified enclaves inhabited in the daylight hours by government office workers, conventioners, and college students, and in the night by a substantial population of homeless persons." The 1996 Olympic Games, along with the transformation of Georgia State University from a commuter school to a traditional college, initiated a resurgence of Downtown that continues today. They resulted in Centennial Olympic Park, which was built as a physical memorial to the games in the former industrial area west of Five Points. In the following decade, Centennial Olympic Park spurred the creation of a Downtown tourist district anchored by the World of Coca-Cola, the Georgia Aquarium, the CNN Center, the Center for Civil and Human Rights, and the College Football Hall of Fame. Following the 1996 games, Georgia State University president Carl Patton, an urban planner, initiated a University-led transformation of Downtown that sought to make Georgia State "a part of the city, not apart from the city." Dubbed the Main Street Master Plan, Patton's vision has been executed through billions of dollars of urban construction, boosting Downtown's economy and population. On March 14, 2008, at approximately 9:40 PM Eastern Daylight Time, a category EF2 tornado hit Downtown with winds up to 135 miles per hour (217 km/h). It caused damage to Philips Arena, the Georgia Dome, Centennial Olympic Park, the Westin Peachtree Plaza Hotel, the CNN Center, and the Georgia World Congress Center. This was the first time a tornado touched ground in Downtown since weather records keeping began in the 1880s. While there were dozens of injuries, there was only one fatality. The area of Downtown contains among the tallest buildings in Atlanta. The tallest building in Atlanta, the Bank of America Plaza building, is situated between Midtown Atlanta and Downtown. Rising at 1,023 feet (312 m), Bank of America Plaza is also the tallest building in any of the U.S. state capitals, and the tallest building in the United States outside of New York City and Chicago. Downtown contains over 26,000,000 square feet (2,400,000 m2) of office space; combined with Midtown as the central business district they make up over 48 million sq ft, more than the CBDs of Dallas, and Miami. Downtown's economy is also driven by its government facilities, venues, and retail options. The Federal government maintains a strong prescience in Downtown. The U.S. Census Bureau has its Atlanta Regional Office in the Centennial Tower and the Atlanta Regional Census Center in Suite 1000 in the Marquis Two Tower in the Peachtree Center. The National Transportation Safety Board operates the Atlanta Aviation Field Office in the Atlanta Federal Center in Downtown Atlanta. The Martin Luther King, Jr. Federal Building was built and "designed and constructed to accommodate the rapidly expanding volume of the Postal Service, which was then oriented around a single, central processing facility." The Sam Nunn Atlanta Federal Center is the ninth largest federal building in the United States and the largest in the southeast. It "houses 5,000 employees for dozens of federal agencies and combines four distinct structural elements in central downtown, equaling 2,000,000 square feet (190,000 m2)." The Richard B. Russell Federal Building, a 1,250,000-square-foot (116,000 m2) mixed-used office building, contains the U.S. District Court for the Northern District of Georgia and offices for several other federal agencies, including the Department of Energy's regional office. Further north in the Fairlie-Poplar district of Downtown is the U.S. Court of Appeals. This court takes federal cases from the states of Alabama, Georgia, and Florida. It is officially named the Elbert P. Tuttle U.S. Court of Appeals building, named after a former Chief Judge of the U.S. Court of Appeals for the Fifth Circuit (the predecessor court to the U.S. Court of Appeals for the Eleventh Circuit). The State Bar of Georgia, the former Federal Reserve Bank of Atlanta. Downtown is also marked by its state, county, and city government facilities. The Georgia State Capitol, the seat of the government for the State of Georgia, is located South Downtown. Its gold dome is visible from the Downtown Connector. The Fulton County Government Center, the seat of the Fulton County Government, is located on Pryor Street. The Fulton County Courthouse is located directly across the street from the Fulton County Government Center. A few blocks away from the U.S. Court of Appeals is the State Bar of Georgia building, the former location of the Federal Reserve Bank of Atlanta before it moved to its Midtown location in 2001. Downtown is home to most of the city's major sporting venues. Mercedes-Benz Stadium is home to the Atlanta Falcons, the city's NFL team, and Atlanta United FC, the city's MLS team. Mercedes-Benz Stadium also hosts major college football events, including the annual Chick-fil-A Kickoff Game, the SEC Championship Game, and the Peach Bowl. In its vicinity is State Farm Arena, the home of the Atlanta Hawks, the city's NBA team, and the Atlanta Dream, the city's WNBA team. It is located directly across Centennial Olympic Park Drive from the CNN Center. Just south of Interstate 20 are the Georgia State University baseball and football stadiums—the latter built from the legacy of the defunct Centennial Olympic Stadium and Turner Field. The Tabernacle, located on Luckie Street, is a music concert hall built in 1910 for the Tabernacle Baptist Church. In 1996 it was converted into a House of Blues Club for the Olympics. It was renamed "The Tabernacle" in 1998. The concert hall is four stories and can seat 2600. AmericasMart is a wholesale trade center consisting of four buildings totaling seven million square feet. The Mart hosts several trade shows every year including Market Wednesday, Atlanta Apparel, Atlanta Spring Immediate Delivery, and The Atlanta International Gift and Home Furnishings Market. Some permanent showrooms are open daily, though many are open only part of the time or during trade shows. Clustered around the Mercedes-Benz Stadium and the CNN Center, the Georgia World Congress Center is a state-owned convention center. Opened in 1976, it was the first state owned and operated major convention center in the United States. As the fourth largest convention center in the United States and with 1,400,000 sq ft (130,000 m2) of space, more than a million people attend conventions at the Georgia World Congress Center annually, and as many 125,000 people attend a single event. Located near the MARTA Five Points Station, Underground Atlanta is Downtown's shopping and entertainment district. During the 1920s, streets in the area were raised above the ground (and the railroad tracks) for a better flow of traffic. Under these viaducts is a district for entertainment and shopping. It contains retail stores, restaurants that serve a variety of different foods, and several nightclubs in Kenny's Alley. The Mall at Peachtree Center, located on Peachtree Street, has 60 specialty shops, including six full-scale restaurants, as well as a regular food court, a conference center in the South Tower. It also includes the Peachtree Center Athletic Club, which contains a 72,000-square-foot (6,700 m2) full service athletic facility. Transit access is provided MARTA's Peachtree Center station that is directly connected to it. The Consulate-General of Argentina, The Consulate-General of Germany, Consulate of Belgium, and the Consulate-General of South Korea are located in Peachtree Center. The Consulate-General of the United Kingdom is located in the Georgia-Pacific Tower. Woodruff Park, named after Robert W. Woodruff, is a 6-acre (24,000 m2) park in Downtown located a block away from Five Points. The park is the location of the iconic Phoenix Memorial, which memorializes Atlanta's rise from the ashes of the Civil War. Built as a legacy of the 1996 Olympic Games, Centennial Olympic Park, located on 21-acre (85,000 m2) area of Downtown, is the largest downtown park in the United States developed in the last 25 years. A famous part of the park is the Fountain of Rings, the world's largest interactive fountain utilizing the Olympic symbol of five interconnecting rings. The park hosts many events, such as music concerts and a fireworks display for the Independence Day holiday. Hurt Park with its fountain was an attraction in the 1940s and 1950s and a reminder of a bygone age. Just north of Centennial Olympic Park is the Georgia Aquarium, the world's second largest aquarium, after the Singapore aquarium built in 2012, with more than 8 million US gallons (30,000 m3) of fresh and marine water. It is listed as one of the "1,000 Places to See Before You Die". The World of Coca-Cola, situated near the Georgia Aquarium at Pemberton Place, is a permanent exhibition to the history of Coca-Cola. Downtown is in the process of bringing new attractions to the area, particularly in the area clustered around Centennial Olympic Park. In June 2008, Atlanta was selected for the future home of the National Health Museum. It will be near Centennial Olympic Park where it is estimated to attract between 1.1 and 1.4 million visitors per year. Georgia State University, a four-year public research institution, has been a major force in Downtown's resurgence. Downtown has benefited from the flurry of GSU-related construction and land acquisitions as the institution undergoes its transformation from a commuter school to a traditional university. In the early 2000s, under then-president Carl Patton, the university undertook the creation of a master plan that would make GSU "a part of the city, not apart from the city." The resulting $1 billion master plan has led to 14 new or renovated university buildings, including academic structures, student dormitories, dining halls, and sporting facilities. The result is a reinvigorated Downtown, especially in the areas around Woodruff Park and Sweet Auburn. Downtown is a transportation hub for the entire region. The Downtown Connector runs north and south through the district. The Connector is the primary freeway artery for the city. Downtown is also served by Interstate 20, which creates the southern border of Downtown. Downtown also has many surface streets that serve as alternatives to the Downtown Connector. MARTA's east-west and north-south subway lines converge in the middle of Downtown at the Five Points station. The North-South Line has four additional stops at Garnett (in South Downtown), Peachtree Center, and Civic Center (in SoNo). The East-West line has two additional stops at Dome/GWCC/Philips Arena/CNN Center and Georgia State. ^ "Western & Atlantic Railroad Zero Milepost-Atlanta: A National Register of Historical Places Travel Itinerary". 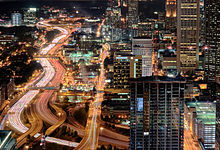 ^ "1782 - 1859 - I love Atlanta". ^ Tornado Claims One in Polk County Archived 2008-04-18 at the Wayback Machine by Tim Eberly and Paul Shea for the Atlanta Journal and Constitution, March 15, 2008. Retrieved March 15, 2008. ^ GmbH, Emporis. "Bank of America Plaza, Atlanta - 121137 - EMPORIS". www.emporis.com. ^ "Colliers Setup SPREADS" (PDF). Archived from the original (PDF) on 2007-09-26. Retrieved 2007-09-04. ^ "The Atlanta Region." U.S. Census Bureau. Retrieved on January 17, 2010. ^ "Regional Offices: Aviation." National Transportation Safety Board. Retrieved on May 15, 2010. ^ "Tabernacle Atlanta - History". Archived from the original on 2008-06-05. Retrieved 2008-06-13. ^ "AmericasMart Atlanta". Americas Mart Atlanta. AMC, Inc. Retrieved 17 February 2012. ^ "Peachtree Center - The Hearf of Atlanta". Archived from the original on 2002-11-08. ^ "Contáctenos." Consulate-General of Argentina in Atlanta. Retrieved on July 28, 2009. ^ "Peachtree Center[permanent dead link]" (Map). Peachtree Center. Retrieved on July 28, 2009. ^ "Address, Contact and Office Hours Archived 2008-11-18 at the Wayback Machine." Consulate-General of Germany in Atlanta. Retrieved on July 28, 2009. ^ "General Information." Consulate-General of South Korea in Atlanta. Retrieved on July 28, 2009. ^ "British Consulate-General - Atlanta Archived 2009-07-21 at the Wayback Machine." UK in the USA. Retrieved on July 28, 2009. ^ "PARK - Georgia World Congress Center Authority". www.centennialpark.com. ^ "Explore the Aquarium - The Georgia Aquarium". Archived from the original on 2008-06-17. Retrieved 2008-06-13. ^ "CAP/ADID- National Museum of Health". Archived from the original on 2008-06-29. Retrieved 2008-06-30. Wikimedia Commons has media related to Downtown Atlanta, Georgia.